Byodo-In Temple in the Valley of the Temples is a scaled replica of a temple at Uji Japan that was constructed 900 years ago. It was built to represent the mythical phoenix, its wings upheld by pillars of stone. Folklore tells of the phoenix rising from the ashes to reflect the promises of hope and renewal. 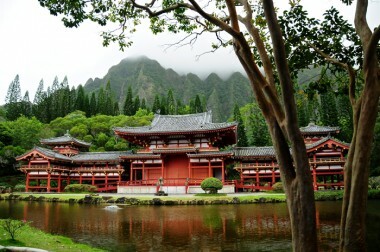 This is one of Hawaii’s best kept public attraction secrets on Oahu. This is a wonderful place to get away to and experience peace and relaxation.